The market for micro consoles continues to grow and we are being flooded with more and more consoles that just don’t live up to expectations. The latest disappointment was AtGames Sega Genesis Flashback which featured inferior quality emulation. It is starting to feel as though the industry is just trying to make a quick buck on nostalgia and retro gamers -myself included- are being milked for all we are worth. 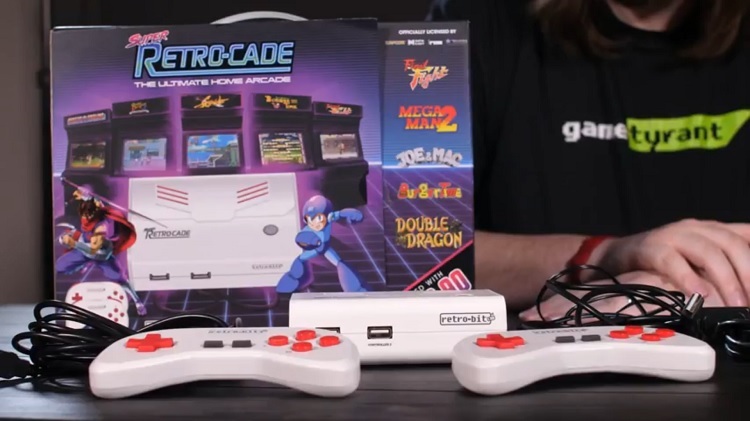 The Super Retro-Cade is the latest micro console from hardware manufacturer Retro-bit. Retro-bit is no stranger to the scorn of the retro community, as in 2016 they released the Generations console, another example of inferior performance. Should gamers care about Retro-bit’s latest offering and put time and money into the Super Retro-Cade? Let’s find out! Inside the box we have the Super Retro-Cade console, which shares an identical design to 2016’s Retro-bit Generations micro console. This time around the Retro-Cade sports a white with red accents color design instead of black. The whole unit is nice and compact featuring a footprint around the size of an NES Classic Edition. The power button lights up when the unit turns on, providing a nice red glow that fits with the color scheme. The front of the unit features a clean design consisting of 2 USB ports for the included controllers -more on them in a bit- and a Retro-bit logo. The back of the unit features an SD card port that allows users to copy saves and save states from the Retro-Cade that can then be used on other Retro-Cade units or PC emulators. AV options for the Retro-Cade include composite and HDMI ports which are also found on the back of the unit. Next up are the 2 included USB controllers and man these things look strange. Imagine for moment that a model one Sega Genesis controller and a Super Nintendo Controller were fused together into some ultimate being, and you have the Retro-Cade controller. Design aside, the controllers feature the same white and red aesthetics as the main unit itself, which does look nice. Of course, the most important thing about a controller is how good the buttons feel and well, these are almost there. The face buttons and d-pad all feel good to initial touch, but the shoulder buttons are far more resistive and gummy than I would personally prefer, and I will be seeing if that affects anything once we break into the games. The controllers are USB so they can be used on PC as well for anyone hoping to get more use out of them other than on the Retro-Cade itself. Next, we have the HDMI cord and power cord, which thankfully isn’t USB; Having a traditional power cord makes me happy. Finally, to round out the package is the instruction manual, which made me chuckle a bit since it couldn’t seem to decide if it was going to be a cheap afterthought or a premium document. Overall this first impression of the unit itself has been good and I can’t wait to dive in and really dig into the games and see how the unit and controllers hold up. The greatest things about these all-in-one micro consoles is the fact that they feature officially licensed games for a far cheaper price than buying each of the included games individually. The Super Retro-Cade is no exception, featuring 90 classic games spanning Arcade, NES, SNES and Sega Genesis platforms. Including hits from Capcom, Data East, Irem and Technos, huge publishers during the golden age of 8- and 16-bit gaming, the Retro-Cade includes an impressive number of classics. Most notable inclusions in the game library for me include Mega Man 2 and 3, (my 7th way to play these games, hooray! ), Strider, 1942 and Bionic Commando from Capcom, Joe & Mac (oh sweet childhood! ), Joe & Mac: Caveman Ninjas, Midnight Resistance and Super Burgertime from Data East, R-Type III from Irem and Double Dragon from Technos. To further add to the value, the Super Retro-Cade also features a pair of games making their way to the States for the first time in wide release! Armored Warriors by Capcom is a mech based beat-em-up that saw release in Japan under the name Powered Gear - Strategic Variant Armor Equipment. The game would later be released in Europe, but for the US it was only released in limited quantities to the point many might believe it never came stateside before. Boogie Wings, a unique shooter for the time, was released in Japan, under the name The Great Ragtime Show, but again saw extremely limited release stateside that it might as well not have existed. The menu of the Super Retro-Cade is well laid out in a grid with each game being represented by a screenshot of the title menu. Numerous sorting options for the game library, such as by genre, are also available. Click here to see the full list of the included games. The biggest downfall of all emulation based micro consoles is the quality of emulation. The NES Classic had numerous input lag issues. The SNES Classic had frame rate issues in more demanding games. The Retro-Bit Generations had generally poor and downright wrong emulation in both video and audio. Does the Retro-Bit Super Retro-Cade fare better then it’s predecessor…? To my surprise, yes! Games run identical, or so near identical, to real and emulated hardware that I am hard pressed to tell the difference in most games. There are some notable exceptions, however, the biggest of which being Double Dragon. While the game doesn’t run that well to begin with even on high end PC emulation, the Retro-Cade just struggles with this old classic. As more and more sprites fill the screen, the frame rate drops alongside them. Other things to note are some games do have an occasional audio stutter, but it wasn’t until I was editing the captured footage that I even noticed them. Check out the below video to see how the Retro-Cade stacks up in 9 of its included games. Since the Retro-Cade is using Emulation, each game can take advantage of the usual suite of emulator features, such as save states, and various video and audio options. As something of note, the Retro-Cade defaults to a stretched image for each game, so be aware that if you want to see each game in its real presentation you will have to set each games resolution manually. Lastly, button mappings for each game are changeable to better fit the user. As I noted earlier about the shoulder buttons of the included controllers feeling off, I am happy to report that during gameplay I didn’t even notice and quite honestly forgot that I was even using a non-standard SNES style controller. The controller was always responsive and stayed comfortable even during longer play sessions. Other controllers can be used in place of the included controllers if you so desire. As of this writing I have tested Xbox One, DualShock 3 and 4, Microsoft Sidewinder (yeah that old one), Switch Pro controller, USB SNES controllers, and finally a Mayflash arcade stick. However, except for the Sidewinder (D-Pad only) and the Mayflash arcade stick (stick only), I personally was not able to successfully get any other controllers to work. I tried to manually configure the controllers to see if I could get the buttons to respond, but each time was met with failure. I have seen plenty of others have success with using other controllers though, so the problem is most likely due to my unit. Something that I was really interested in testing out was running the Super Retro-Cade on an old school CRT TV to really nail down the feeling of playing in an arcade. The included composite video ports made it easy to plug it in and start playing. Things weren’t as smooth as I would have hoped however, with the Retro-Cade not being able to switch its aspect ratio to match that of the CRT. As a result, the 16:9 image can’t display properly on a 4:3 TV resulting in either clipping or a squished image. Unless it has a 16:9 enhanced mode, like a Sony Trinitron, don’t expect the best results out of a CRT TV. Retro-bit really took the feedback received from the Generations shortcomings and the Super Retro-Cade accomplishes nearly everything it sets out to do! A solid library of classics in an easy to afford and use package is impressive, especially considering the many games included would cost over 3 times the asking price of the unit by themselves. The included controllers were far better than I could have hoped for and the ability to use your own really allows you to play how you want, Well, unless you don’t have the right kind of CRT, sadly. While performance isn’t 100 percent perfect, it is very close and the best I have seen in a third party created micro console of this caliber. So, should gamers put time and money into the Retro-bit Super Retro-Cade? If it has the games you are looking for, absolutely!